Packaging Manager is used to package Sales Orders into shipments for EDI transactions. Acctivate can automatically package the shipment into separate cartons based on a number of settings. The weight of each carton can also be calculated based on the weights of the products as entered into the Specs tab of the product. Shipping Carriers need to be linked to SCAC (Standard Carrier Alpha Codes) codes in order to show the carrier in Packaging Manager. Here is list of widely used codes. The SCAC code is received from the EDI Trading Partner on the 850 (Customer Purchase Order) and brought into Acctivate. If your SCAC codes attached to your Carriers in Acctivate match the SCAC codes sent on the 850, then Acctivate will choose the corresponding Carrier and Service to add to the sales order. (i.e. The code UPGF translates to UPS Freight, while UPSC denotes UPS Canada services.) Consult your Trading Partner or EDI Provider if you are unsure what the SCAC code means. The SCAC is also sent on the EDI 810 (Customer Invoice) and 856 (Advance Shipping Notice) to the EDI Trading Partner to verify the method of shipment that was used. 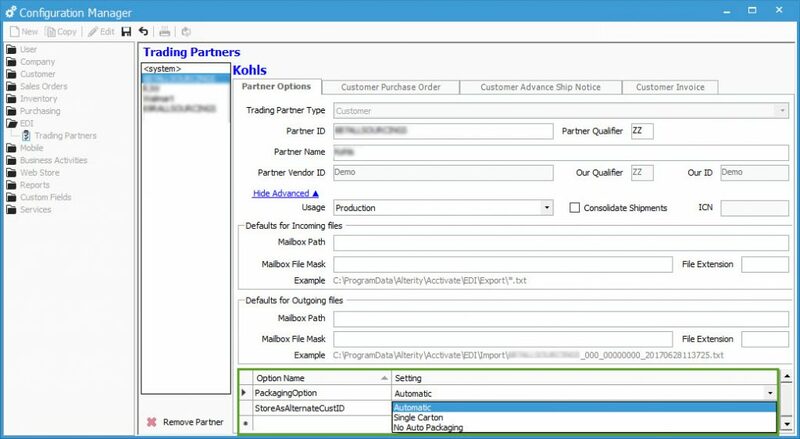 There are a few Trading Partner specific options that can be set up related to the Packaging of your shipments for EDI transactions. Within the EDI section of Configuration Manager, after selecting a specific trading partner, if you select to ‘Show Advanced’ on the Partner Options tab, an option will show called ‘PackagingOption’. There are three choices for Packaging Option. Automatic: Cartons will be packaged based on the Product Packaging Unit. This is the default option. Single Carton: ALL products included in the shipment will be packaged into one Carton. No Auto Packaging: Acctivate will not automatically package the shipment and will instead leave the package as ‘Created’ without any cartons added. You can also configure your Shipping Workstation to import and export EDI Packaging Manager Shipments from Acctivate. This requires a separate mapping than your normal configuration. See this article for the FedEx Shipping Workstation mapping for EDI/Packaging Manager and this article for the UPS Shipping Workstation mapping for EDI/Packaging Manager.